September 2014. Sparkles are the effect of a cheap lens and greenhouse glass! On Thursday 5 January Dom Meinrad Gibson died in a holy and very peaceful manner, in his monastic cell, surrounded by the prayers of his brethren, and supported by all the rites of holy Church. The Requiem Mass, followed by the Burial in our cemetery, was held on Friday 13 January. Br. Meinrad was born in Dundee into a large Catholic family on 28 January 1934: so he was not quite 83 when he died. He did National Service in the RAF, and worked for a time in the Steel industry. He was regarded as rather a late vocation when he entered Pluscarden Priory aged 34, making his first profession on 24 August 1970. The name Meinrad was given to him by (then Prior) Alfred. It was in honour not so much of St. Meinrad, the 9th century hermit, as of Br. Meinrad Eugster (1848-1925), a lay brother of the Benedictine Abbey of Einsiedeln in Switzerland. The cause for beatification of Br. Meinrad Eugster has long been in process: he was famous for his holiness, humility and hard work. When James Gibson entered the Pluscarden community, it seemed in rather a fragile state. Vocations had been few, money was not at all abundant, and the accommodation in and around the mediaeval ruin was extremely spartan. James seemed an unlikely candidate, but he stayed; and his staying was crucial for the later development of the community. He always retained something of a place as backbone or heart of the community. He was elected dean, or member of the Abbot's Council, soon after his solemn profession. That post is renewed every three years, but he held it without interruption until shortly before he died. Under Abbot Hugh he was appointed first Sub Prior, then for several years Prior. Pluscarden community with Abbots Braso and Parry July 1969. The Abbots in black are our Abbot President Gabriel Braso, and our Abbot Visitor, Abbot David Parry of Ramsgate. Postulant Gibson (Br. Meinrad) is in the middle row, behind the Abbots, next to the famous Dom Hubert Van Zellar, in his black Downside habit, though he was to spend several years at Pluscarden. Notice that Prior Alfred is not wearing a pectoral cross, because he's not yet an Abbot! Br. Meinrad was of a placid disposition. He was no friend to haste, hurry, bustle, feverish activity, or energetic toil. Some who had lived with him for many years asserted they had never once observed him move swiftly. He was certainly steadfast though. 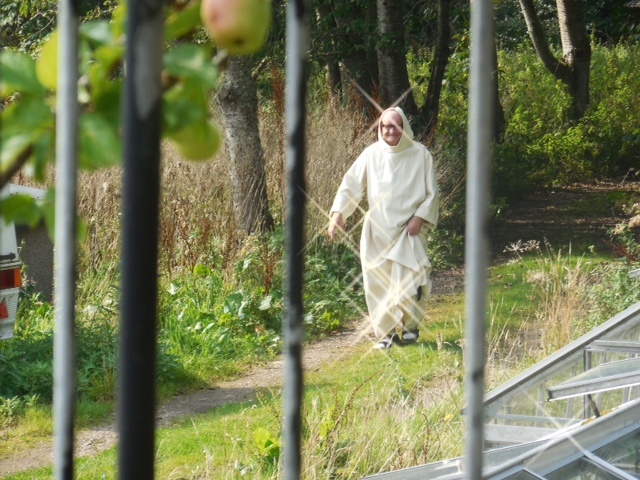 He loved working with engines, vehicles, gadgets and plumbing; so he did maintenance work throughout his monastic career, also taking care of our lawns and grounds. He was always extremely faithful to the Divine Office, and also to his own prayers and devotions. He had great trust in Our Lady. He always had something of a focus also on death, and the Last Things, and on desire for heaven. Br. Meinrad's own death was precipitated by a cancerous growth which closed off the bile duct on his liver. After a stent inserted by key-hole surgery failed, his decline was quite rapid. His attitude towards the end was consistently cheerful, accepting, grateful and faith-filled. Happily he was able to prepare for death in his own monastic cell, with little or no medical intervention; his mind clear, and his disposition calm and peaceful. To send an appreciation, please use our contact form. You are right that Meinrad was ready to go. In fact, he's been preparing to go since the day we walked into Pluscarden together. You recall the story about why I was no. 3 in the group and he was no. 4? He claimed he actually arrived before me, but stopped halfway up the drive to consume his last packet of fags! A good story illustrating St Benedict's strictures about the criterion for seniority, although, as we all know, it was not, in fact, his last packet of fags! By all the usual measures, and, by his own reckoning, he was the least likely of the four of us to stay. But he was the only one who did - and for how long! Some of us had fancy ideas about why we were there and thought we could write them down and explain them to people. He walked into a culture that was completely new to him, absorbed it and lived it day in, day out exactly (I imagine) as it ought to be lived. Without all the rhetoric, he just lived the life of a monk. When the end came - and long, long before it came - he was ready to reach its explicit conclusion. May he rest in peace and pray for us all to follow. Frances Johnston, fellow novice with Br. Meinrad in the late 1960's and early 1970's.